Children can do lots of things that robots and computers have trouble with. Climbing stairs, for example, is a tough thing for a robot. Recognizing objects is another area where humans are generally much better than robots. Kids can recognize blocks, shapes, colors, and extrapolate combinations and transformations. Google’s open-source TensorFlow software can help. It is a machine learning system used in Google’s own speech recognition, search, and other products. It is also used in quite a few non-Google projects. [Lukas Biewald] recently built a robot around some stock pieces (including a Raspberry Pi) and enlisted TensorFlow to allow the robot to recognize objects. You can see a video of the device, below. [cunningfellow] has been putting LEDs in everything lately. That’s understandable. Most recently, he used them to drastically upgrade his father’s super-cool mid-century slide viewer. 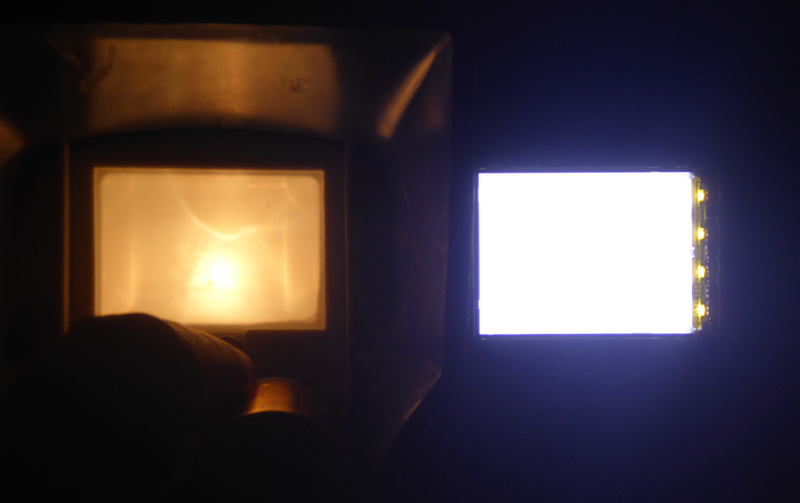 The slide viewer used to use a flashlight bulb, but it didn’t light evenly at all. Not only that, it produced a dim, orange-ish light. [cunningfellow] happened to have an old Nokia N93 lying around and decided to cannibalize that strange, beautiful, swiveling flip phone for its backlight circuitry. Unfortunately, the 4 LEDs aren’t going to run on a pair of C cells like the flashlight bulb did. [cunningfellow] needed some kind of boost converter. He found one in the form of a Nokia E73 LCD driver board created by [Andy Brown]. The LEDs are way brighter than that old incandescent bulb, and they draw about 10mA less to boot. We think [cunningfellow]’s father will be happy with the result. If you have an old slide viewer and no slides, try using it as a project case. If this post makes you miss your View-Master (also understandable), you can always turn your phone into a stereopticon. There are only two ways of creating two perfect copies of a person: 3D printing and twins. 3D printing magician [Simon] the Sorcerer 3D-printerer uses his secret knowledge to create the perfect illusion: A 3D-printing-real-people prank. How much would you pay for a 360 degree camera? How about $15 if you already have a Raspberry Pi and a Pi camera hanging around? If you don’t, you’ll have to add that minimal cost into the build. [Gigafide] noticed how a spherical mirror, made to see around corners, showed an all-around view if you took a picture of it from below. He snagged a panoramic lens made for an iPhone and stripped it for its optics. Some custom software and a little work resulted in a usable 360 degree camera. SimpleCV (a light version of OpenCV) provides the algorithms to unwrap the frames and you can take video with the setup (see the video below). Mounting the optics took some 3D printing and the Pi operates as a hot spot to send the video out.